At the Branch we place a high value on community and that community can come in many forms. We know music brings people together. We also know that going out for a drink with some friends can make us feel like a part of a family. 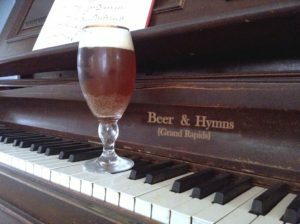 Because we are dedicated to bringing people together over tradition, fellowship, worship and a pint, every 4th Tuesday of the month we go out for a beer and sing hymns. Aptly named Beer & Hymns Grand Rapids, the Facebook page keeps you up to date on each month’s happenings held at The Last Chance Tavern & Grill on Burton (and the 2nd location at the Knickerbocker!). We’d love for you and your family (yes, even the kids) to join us!